Our product range includes a wide range of landis & pipe threading machine, bolt threading machine, rod & bar threading machine, scaffolding pipe threading machine, lanco threading machine and bolt & pipe threading machine. Compact structure made of cast aluminium alloy light weight, easy operation, good safety & low noise, reffer to the international advanced technology suitable for threading requirement of pipe & bolt both for BSPT/NPT/MM/BSPP/BSC providing one set of Die head with machine for BSPT or NPT & Bolt die head for various thread can be order separately. Dependable clamping, free from slip & deformation. Self-lubricating die head & two more additional functions are pipe cutting & De-burring of pipe. Our supreme quality range has earned us the accolades of clients from national and international market. Excellent functionality and durability of the range has made it the first preference of the customers. The Bolt Threading Machine is use to cut the external threads with the help of Tangential chaser. Chaser is use as a cutter in Bolt threading machine. Bolt remain still, Die-head rotates and different type of threads can be cut parallel and taper such as BSPT, BSW, BSP, NPT, UNF, METRIC, UNC, ACME, BSF Threads. BOLT THREADING MACHINES are designed to give maximum efficiency and reliable performance under the most severe conditions of service with minimum maintenance cost. All the necessary requirements are combined in this model to from the basic fundamentals of correct threading. All the gears are made of case hardened steel with extra large face with and tooth thickness and cut on hobbing machine for noiseless operation even at high speed. Naturally the are built with high standards of workmanship, material and quality so closely associated with COMPANY TRADITION. DESIGN & WORKMANSHIPThe Industrial Machinery Corporation Bolt Threading machines are designed to produce quality threads within the tolerance for which they were intended. HEAD STOCKA heavy duty geared Head Box is of best quality casting providing support to the spindle bearings. The box is of gear type, lubricated, fitted with three extra heavy duty bearings. THE BEDThe bed is pillar type having two pillars made of best quality steel nicely finished & duly hard chrome plated in the most modern hard chrome plating unit. THE SADDLEThe Saddle is fitted on two pillars very precisely. It runs on pillars very smoothly and accurately to the Head Stock alignment. THE APRON The apron gives movement to the saddle with head transfer along with pillars through steel rack and pinion arrangements. It's all gears are made of best quality steel. VICE JAWSThe vice jaws made from the best quality alloy steel are fitted on the saddle well aligned with the head stock center fitted in a heavy duty box type vice. The jaws are heat treated. The movements of jaws are controlled by a screw on the saddle. Rod & Bar Threading Machineis used for Cutting External Thread on Rod by Chasing method. HSS Threading Chasers are used as cutters. Rod remains stationery and Die Head rotates. Matric, BSP, BSPT, NPT, UNF,UNC, BSW, Acme Threads B.S.F etc. threads can be cut on this rod threading machine depending upon the type of Chasers. OM International Machine Tools are Threading Machine Manufacturer, Exporters, and suppliers In INDIA. ROD & BAR THREADING MACHINE is designed to give maximum efficiency and reliable performance under the most severe conditions of service with minimum maintenance cost. Threading machines are designed to produce quality threads within the tolerance for which they were intended. We offer a wide range of well designed Threading Machines in India and abroad. These Threading Machines are robust in design, efficient, and durable. our Threading Machine is that we thoroughly check the raw material that we use for its quality and after it has surpassed all the quality checks and assessments, it is permitted to be used in our factory. TheRod & Bar Threading Machineof OM International Machine Tools has many notable features which empower this machine to give our results in form of highly precised and accurately finished high quality threads despite operating at a very high speed. H.P. Required 3 H.P. 3 H.P. 7.5 H.P. Scaffolding Pipe Threading Machine is used for Cutting External Thread on Rod by Chasing method. HSS Threading Chasers are used as cutters. Rod remains stationery and Die Head rotates. Matric, BSP, BSPT, NPT, UNF,UNC, BSW, Acme Threads B.S.F etc. threads can be cut on this rod threading machine depending upon the type of Chasers. 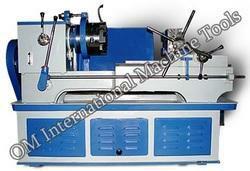 OM International Machine Tools are Threading Machine Manufacturer, Exporters, and suppliers In INDIA. SCAFFOLDING PIPE THREADING MACHINE is designed to give maximum efficiency and reliable performance under the most severe conditions of service with minimum maintenance cost. Threading machines are designed to produce quality threads within the tolerance for which they were intended. We offer a wide range of well designed Threading Machines in India and abroad. These Threading Machines are robust in design, efficient, and durable. our Threading Machine is that we thoroughly check the raw material that we use for its quality and after it has surpassed all the quality checks and assessments, it is permitted to be used in our factory. TheScaffolding Pipe Threading Machine of OM International Machine Tools has many notable features which empower this machine to give our results in form of highly precised and accurately finished high quality threads despite operating at a very high speed. Lanco Threading Machine is used for Cutting External Thread on Rod by Chasing method. HSS Threading Chasers are used as cutters. Rod remains stationery and Die Head rotates. Matric, BSP, BSPT, NPT, UNF,UNC, BSW, Acme Threads B.S.F etc. threads can be cut on this rod threading machine depending upon the type of Chasers. OM International Machine Tools are Threading Machine Manufacturer, Exporters, and suppliers In INDIA. LANCO THREADING MACHINE is designed to give maximum efficiency and reliable performance under the most severe conditions of service with minimum maintenance cost. Threading machines are designed to produce quality threads within the tolerance for which they were intended. We offer a wide range of well designed Threading Machines in India and abroad. These Threading Machines are robust in design, efficient, and durable. our Threading Machine is that we thoroughly check the raw material that we use for its quality and after it has surpassed all the quality checks and assessments, it is permitted to be used in our factory. TheLanco Threading Machine of OM International Machine Tools has many notable features which empower this machine to give our results in form of highly precised and accurately finished high quality threads despite operating at a very high speed.